5-DAY TRIAL MembershipOnly $5 !! Get started NOW! Immediately. No Gym Membership required. No special equipment required. 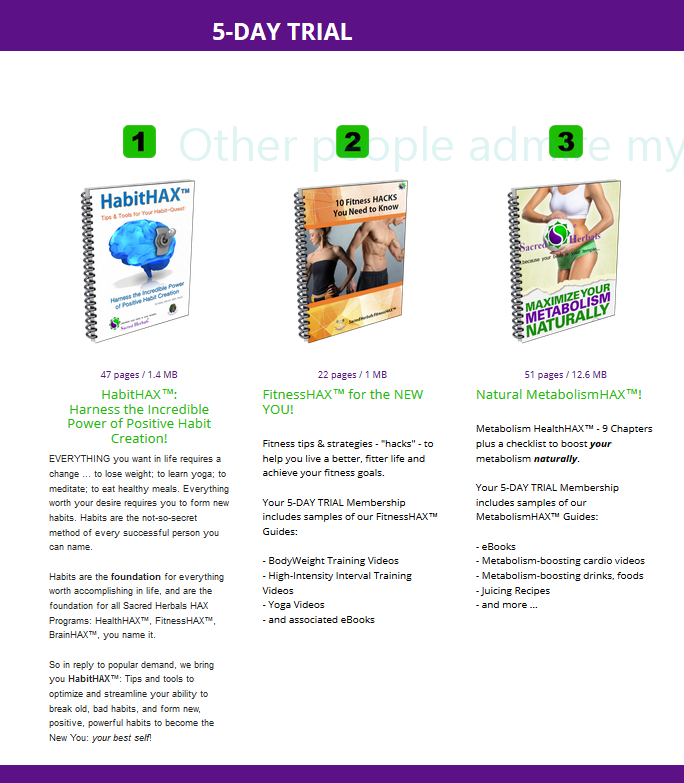 Our HealthHAX™ programs provide universal value: great for men & women, and all ages Always wanted to learn Yoga, but too self-conscious for yoga-class? Download your FREE copy of Sacred Herbals Yoga for Beginners Planning, shopping, and preparing healthy meals just too time-consuming? Sacred Herbals eBooks recipe eBooks will speed you on your journey to the NEW YOU! Learn how to stay fit even if you sit at a desk all day! Learn how to boost your metabolism - burn fat! - using natural means. No "energy drinks" No "energy supplements"
What are You WAITING FOR?IT'S Only $5 ! !